If you are like me, you’ve spent the month falling in love with dragons. You’ve probably made more than 2 by now and you’re loving every minute of it! Why? Because when you read through Christi’s books and learn her style, her humor and love for the inconsistencies in claying inspire you to be more creative than you thought you could be! Last week you were challenged to create a dragon with arms and legs. So now that you’ve made your own version of the Wendyll dragon, and since you’ve mastered how to do arms and legs (yes, I know they are tricky, I don’t like them either) it’s time to do something with that adorable dragon! So we’re going to delve into the back of Christi’s book to gain inspiration and ideas … but your job this week is simple … you are going to create something functional with your dragon. Perhaps a pin, brooch, vase, wall hanging, sculpture, necklace … whatever you want! This week is yours! Show off your mad polymer clay skills and get to work creating something unique with you dragon! Choose one of the options below and make your own Christi Friesen inspired dragon! One of my favorite things to do is to make figurines … as you most likely already know because I have a whole store dedicated to cute little characters from my imagination … that being said, I am often partial to making figurines and make them often. But many of you that have joined the project do not make figurines, perhaps you focus on making jewelry from polymer clay. There are literally thousands of things you can do to make a figurine. I like to put all my figurines on a base of polymer clay. Most often this is a flat base, but has been other things as well (visit my gallery for some ideas). Make sure that you look at Christi Friesen’s Dragon Book on page 42-43 to see some of her awesome creations. Be sure that when you make a sculpture that you do not forget to sign the bottom of your item. Here’s a simple tip that will help you to emboss and put mica powders inside your signature or stamp to make them stand out! Make sure you secure your figurines using wire and TLS or Bake & Bond. I personally do not do this, but many clayers use foil as the base for their sculptures and cover it with clay. Christi also suggests in her book to cover a rock with clay! What a great idea! If your sculpture is large, it is okay to bake it in stages … especially if you are afraid to “smoosh” the details. For me personally, this isn’t an option … why? I’m not really a “jewelry” person. I wear earrings from my brother & a ring from my parents I received when I was ordained, as well as my wedding ring … and that’s it. So … this option doesn’t appeal to me. However, there are literally hundreds of polymer people (just like YOU) who love jewelry and focus 90% of their polymer crafting toward jewelry making. With this being said, make something awesome with your dragon. If I had to choose one of the above, I would definitely make a pendant. Why? Because they are the most fun. They allow me to express myself twice: once with the pendant and then with the necklace I would make afterward … even though I likely won’t wear it, but will gladly give it away! Experiment and try something new this week, after all that’s why almost 200 people from around the world have joined this project: to learn something new and jump outside their comfort zone. Try a cabochon or try a multi-part necklace with dragon and matching baby dragon egg beads … or something like that! Check out Christi’s “almost” necklace on page 45 and see the awesome Dragon parents and their offspring (so cute I want to hug them)! Now this is something that I do love: pins! I love pins that sparkle, have pizazz, design, flair, and that “cute” factor that is embedded into who I am. I wear pins on my sweaters, coats, sweatshirts … it doesn’t matter. I love that I can take a black sweater for an evening out, add a dragon, and be a medieval version of myself (or something like that) with a fiery temper that matches my dragon … or something like that. Christi gives detailed instructions in her Dragon Book on page 41 on how to attached a pin back to your dragon cabochon or mini-sculpture. This is something that will challenge you, push you to the limit, and probably make you wish you’d never tried it at least once or twice. For many of you, this will be something that will take you several hours (my guess is 5-24 hours) of hands on working time. Please know that this will not be the first time in this project that we will try something like this, so if you are not up for it, don’t worry … you will get another chance … and next month, you’ll be forced to do a wall piece. This is the final week for our polymer clay dragon creations … and I don’t know about you, but as for me, I am rather sad. The Dragons ranks as my #2 favorite Christi Friesen book. (Anyone want to guess what my first favorite is?) 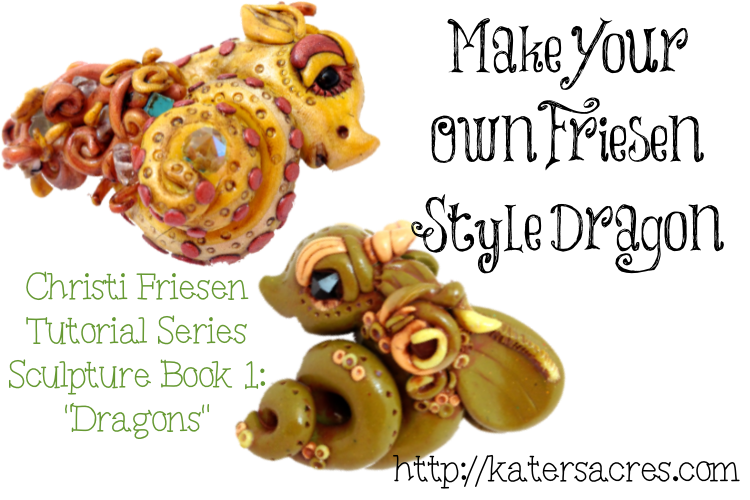 I know that I will be making polymer clay dragons of many shapes, sizes, and in a Friesen style for a very long time. Next Friesen Friday we will begin Book 2: Welcome to the Jungle. We’re going to have several different projects from this book. Unlike the Dragons book, Christi has ventured into many Jungle scenes and creatures. Next month will bring you a little bit of all things jungle for you to do, try, and practice! I finished my second dragon…now on to the third! I’ll be sad to see the dragons end, too, but I am looking forward to the next book! Love the way (modeling too) you work your dragon into a Parker scene.